Add a splash of color to your home with this quick project. 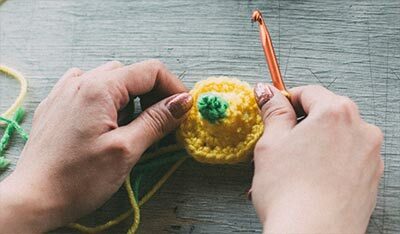 The knitting is as basic as it gets (2 squares) and you can express your creativity (and use up odds and ends from your yarn pile and button collection) in the simple embellishment. 8 stitches and 10 rows to 4" over Stockinette stitch (St st = knit one row, purl one row) with 3 strands held together and size 17 (12.75mm) needle. NOTE: Depending on the yarns you select, you may need to use 4 strands held together to achieve the gauge. NOTE: Pillow square is knit with three strands of yarn held together. Cast on 32 stitches. Work in St st until piece measures 16". Bind off loosely. Draw the needle up through the work. Insert the needle back next to where it just came out, and take a short stitch. 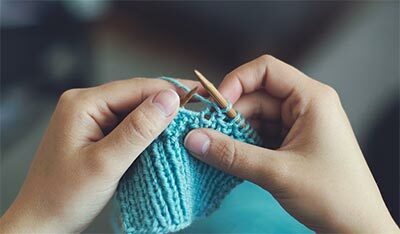 Hold the yarn in place with your thumb, and with the needle point above theyarn, draw the needle through. Insert the needle back into the fabric on the other side of the stitch, securing it with a bar. Form each succeeding petal in the same way, always bringing the needle up into the center of the circle. 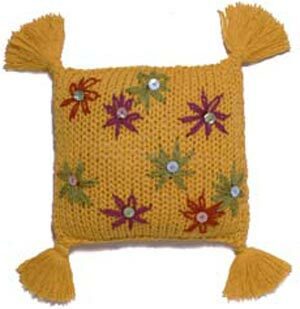 Embellish one pillow square for front of pillow (back optional): Cut 3' length of yarn in a contrasting color (CC), thread into tapestry needle and with doubled yarn work Lazy Daisy stitch flower following diagram. Repeat at random using photo as a guide. Secure button in center of each flower as follows: Thread the end of a strand of CC up through one hole of button and down through second hole, using tapestry needle to push, thread both ends of the strand into tapestry needle and sew through center of flower and secure at back with a knot. Sew pillow as follows: Align pillow squares with fronts together and wrong side facing out. Pin. Thread tapestry needle with MC and with doubled yarn back stitch around three sides. Turn pillow case right side out. Insert pillow form. Close the remaining side with slip stitches. Make 4 tassels and attach one at each corner.